Pamela Slim, a fellow blogger, introduced me to a young woman named Glenda Watson Hyatt awhile back. I was intrigued by this woman's story and her goal of getting her autobiography published by her 40th birthday. She missed that deadline by a only one month. 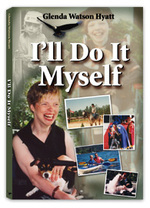 This week, her book, "I'll Do It Myself" was published, and it would make a great Christmas present. A lack of oxygen at birth left Glenda with little use of her hands, the inability to walk and speech that was difficult for others to understand. But it didn't hold her back from experiencing a full and happy life. In school, Glenda was integrated into a regular classroom; she earned the Canada Cord, the highest award in Girl Guides; and she won the Outstanding Junior Student Award. And this gutsy young red-head even won a gold medal in horseback riding! Glenda is now married and works as a writer, especially on the topic of disabilities.